Chicken Parm. It's like the Club Sandwich - it's everywhere, it's on every room service menu in the USA, and I never order it. But, I know it like the back of my hand, and I love it. There is nothing wrong with cheese melted into and then on top of chicken. That's like chocolate on chocolate - awesome. 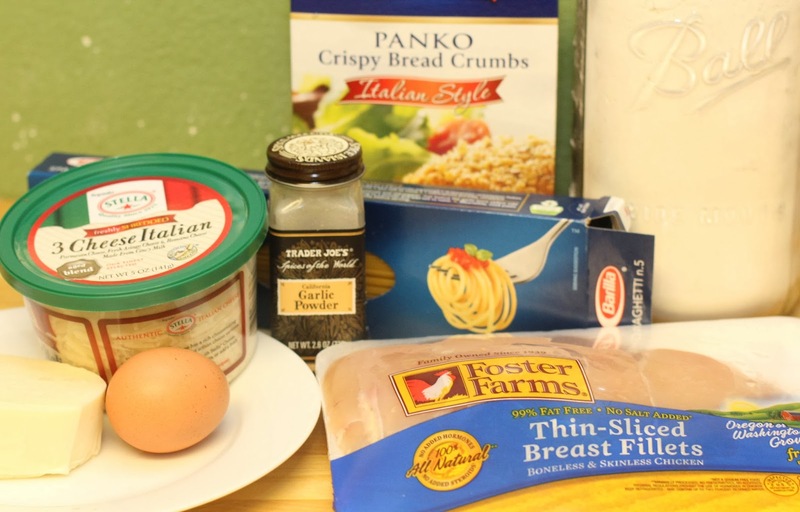 Recently, Cooking Light had a remake of Chicken Parmesan and basically it was a portion controlled edition of what is generally a huge meal. I made a few tweaks, and a few changes (non-fat cheese and I are divorced) but the great parts are still great and the portions are filling, but not coma inducing. 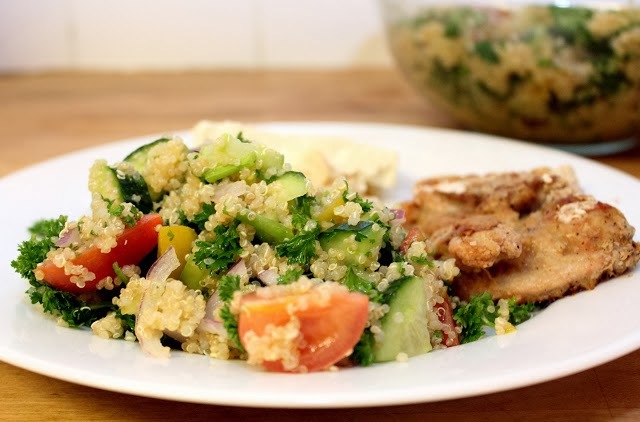 This is a great dinner, quick to get on the table and loved by the whole family, including our toddler. 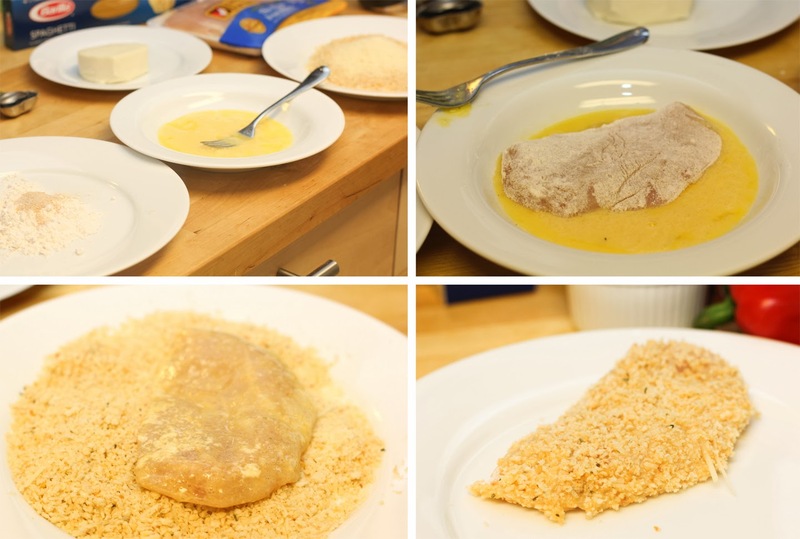 A while back, Antoinette made a delicious Chicken Milanese. 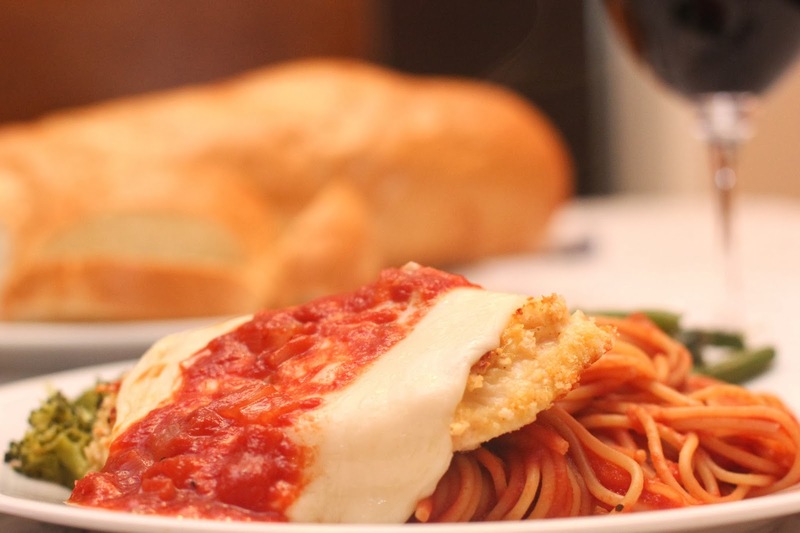 Chicken Milanese and Chicken Parmesan are quite similar, just a few swapped seasonings and quantities, but the technique is the same. This is just a great way to cook chicken! 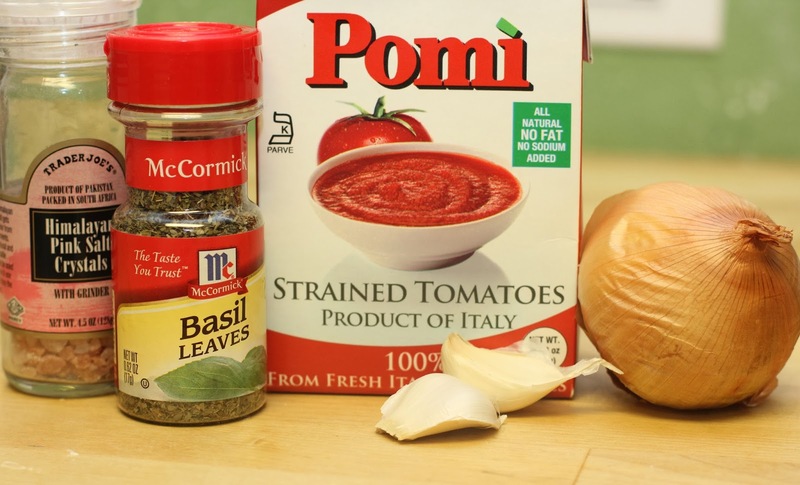 In a small sauce pan, combine onion, garlic, butter and tomatoes. Stir in seasonings and set to simmer while you make the rest of the meal. This needs about 30 minutes to soften all of the onions, so I like to start it a few minutes before I even start the chicken. Station 3 plate: Panko crumbs. Combine Panko bread crumbs and Parmesan cheese. First, dip chicken in the seasoned flour, shaking off excess. Then dip chicken in beaten egg. Next toss chicken in bread crumb mixture, pressing the bread crumbs in so they stick well. 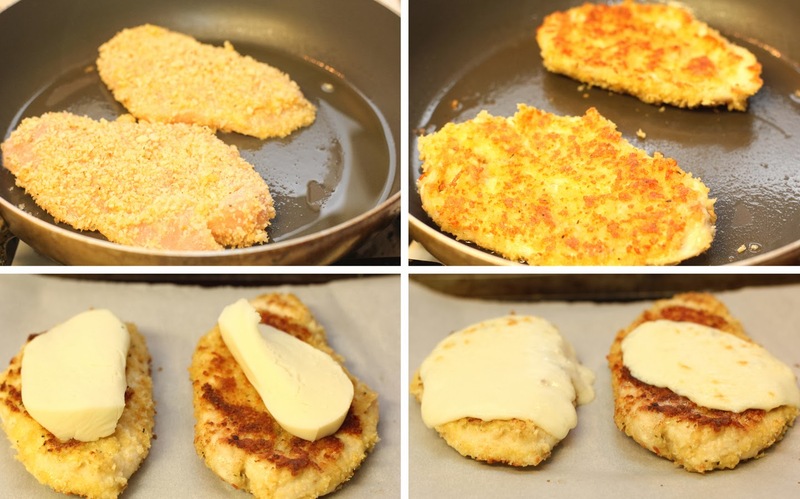 Once all of the chicken is coated in bread crumbs, start a non-stick skillet to medium heat and add 1 teaspoon of olive oil. I was able to cook these in batches of only 2. The chicken needs some room to brown well rather than steaming and getting soggy. Don't worry about it cooling down, it goes back in the oven in just a sec. OK, so cook chicken in batches, about 4 - 5 minutes on each side or until thoroughly cooked and nicely browned. I had three batches of chicken. On batch 3, start the noodles - they'll be nicely cooked by the time all the chicken has been cooked. Once the chicken is cooked, place on a parchment lined baking sheet and top with a slice of mozzarella. Broil for 2 minutes or until the cheese is melted and browned in places. Toss the cooked spaghetti with the tomato sauce - there will be extra sauce. Spoon the sauce over the chicken. We ate this with broccoli and green beans. Delicious! 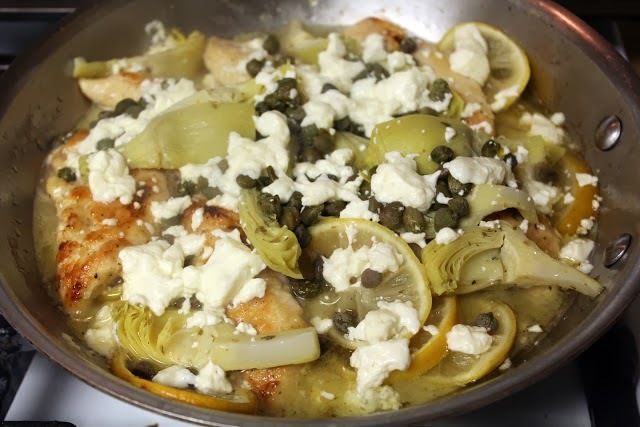 Chicken with Melted Lemons - my husband's last birthday meal! Stuffed Peppers and Mushrooms - and Cupcakes! !